Hey, I’m Julie Hoffman and I’ve led such an incredibly blessed life… I’m so grateful and I’d like to share a bit of it with you. 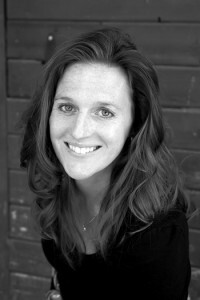 Not too long ago I was just getting started with Real Estate Investment Coaching. I had already been through a lot… I wasn’t sure I could really lead someone else to success as I was already so busy just trying to move forward with all my own deals. But then something happened that changed everything for me. I ended up dealing with a couple in Saskatchewan who were in a very tough situation. They needed a solution and they needed it quick (which normally would have made them perfect people for me to buy from). They had bought high in 2007 (like a lot of us) and life had suddenly changed which meant getting rid of their property. Dad needed to leave and help their daughter in another province and mom was moving into the Big City to be closer to work. Their big problem being they DID NOT want to sell and lose money. They also did not want to be landlords. 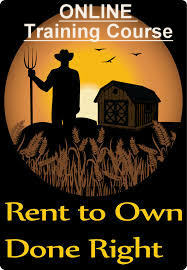 And I did not want to take over a property in Saskatchewan – I just like being closer to my deals…. I’m funny that way. That’s when an idea popped in my head and I suggested I coach them to sell their house. I told them what I could do, what it would cost, and how I envisioned it would hopefully all turn out. You see all they needed was time and with my coaching I was able to not only give them time, but we worked together to find a solution. And it worked Great! Even with a coaching fee included, they would walk away with an extra $17,000.00 AND they were able to help a nice young family purchase a home through a rent to own program. So it ended up being a huge Win Win. And I was hooked. I knew there had to be others who wanted the same help. Help selling without losing money, help buying without having to take a lot of risk and help for all the confusing steps along the way. As I mentioned the last recession was hard on a lot of people and as I was heavily invested in Real Estate at the time, I too went through some tough times. During that time, I wondered “Why is this happening to me? What did I do to deserve what looked like potential bankruptcies and foreclosures?! ?” Those were very dark times. I have since realized I needed to go through those Struggles as part of my journey as a coach. To survive, I found creative ways to make it as a matter of necessity and these creative ways became tools in my coaching tool belt. I appreciate what I went through. Because now I can help people who think they have reached a dead end, a dead end I was at not too long ago. I’ve learned I can help people who want to get started and have been told over and over again “No” by the bank, or by a mortgage broker, or by a realtor. I’ve learned I love finding solutions when others can’t and it’s truly become my passion. A passion I can share with anyone, including you! Well, in my One on One Coaching our goal will be to get you through a successful and profitable deal as a Real Estate investor. And to make sure it works, I’m right there with you all the way through it. Now I could just give you one of my already profitable deals and call it good, but I’d rather teach you to fish on your own so you can continue to find more deals and continue to profit going forward. The intent of this is to have you walk away at the end with AT LEAST $22,000 in profit. That’s after my coaching fees, that’s after any legal costs involved with the transaction and that’s money you get to keep! Here’s how it works on my end, as part of the coaching I have a partial Reservation Fee where a portion of the coaching is paid up front, but I don’t get paid in full until YOU have purchased a deal that will make you AT LEAST $22,000 in profits. If you’re really serious about investing in Real Estate having a coach to work with can make all the difference and with my One on One Coaching Program I not just want you to succeed as your coach, but I really don’t even get paid until you are. This is a huge incentive for me to make sure you succeed unlike many of the other programs you find out there where you have to pay everything up front. So, if you’re ready, I sincerely hope that I can help work with you One on One to be part of getting you to the “Next Level”. 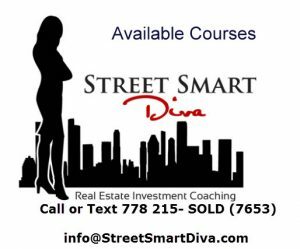 To Contact me about One on One Coaching, please Email the Street Smart Diva . Thanks!